Is it possible, these days, to know every brewery there is out there? Particularly in Pennsylvania, as vast a state as it is? Many, many years ago, I'd pride myself on knowing them all by name, even if I hadn't visited in person or had their beers. 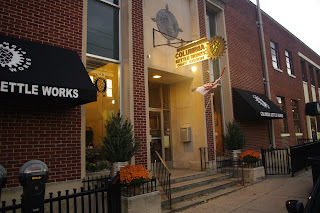 Nearly three years ago, when I began my book research and it took me to places like Titusville, Mansfield, Butler, Selinsgrove, and Tunkhannock, to name a few (yes, all places in PA), I knew it was a more daunting challenge than ever, but still one that was not out of reach. Consider that at year-end 2013, the Brewers Association counted 2,917 breweries in the country. As of 6/30/16, that number was around 4,656 and likely touching 5,000 by this year's end. Pennsylvania ranked eighth in states at the end of 2015 (178 brewing establishments). I'm not sure if there's any one person or organization who can say beyond the shadow of a doubt that they have the definitive list of all operating and in-planning breweries. Therefore, the answer now to that problem, I declare: No. It is not possible to know them all nor visit them all. Which brings me to the south-central PA counties of Adams, Cumberland, Dauphin, Lancaster, and York. 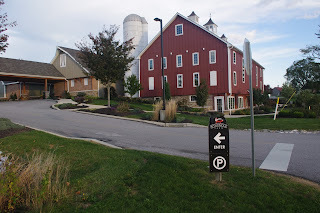 Back in early 2013, the missus and I traversed the area on a simple day trip with Mr. Matt Guyer from The Beer Yard and visited a few: South County, Gunpowder Falls, Mudhook Brewing Company in the Public Market, and Liquid Hero. Snuck a stop into the high-quality Holy Hound Taproom in downtown York as well. In hindsight, not so simple at all. Millworks – What a beautiful re-use of an old saw mill adjacent to the Broad Street Market (on the National Register of Historic Places and cited as one of the oldest continuously-operated farmers markets in the country - since the 1860s) in the midtown neighborhood of Harrisburg. From a beer perspective, just a few blocks from the classic dive bar Shady McGrady's. But, the two could be no different. Millworks began as a home for at least a couple dozen artist galleries. A restaurant was added in 2015 and in summer 2016, the brewhouse was added. Bolstering the reputation right out of the gate was the hiring announcement of Jeff Musselman to lead the brewing. He came with a resume that included Tröegs and the quality is already obvious. At first glance, a draft list of seven in-house beers (amongst a total of 20 on the tap tower) that included Session IPA, Farmhouse IPA, IPA, and Double IPA concerned me. Pleased, on the other hand to see some solid and straightforward ones like Oktoberfest, Oatmeal Stout, and Saison. After some significant sampling where I detected no noteworthy flaws, I settled into a Farmhouse IPA. Then another Farmhouse IPA. Then, finally, a crowler of Farmhouse IPA to go. More often than not, I find that beers trying to showcase both yeast and hops - Belgian IPA, if you will - end up getting it wrong to the point of not being overly enjoyable. In this case, the balance of yeast and hop profile is so perfect that this could wind up on my best-of list for 2016. In addition to the building's gallery space and the comfortable bar area, restaurant seating, and outdoor patio, there's a rooftop Biergarten open during cooperative weather. The brewery is new, so this may not have made it to your radar yet. It should. They've got all sorts of events, including a "Holiday Bizarre", coming up. That could be your excuse to check it out, as if you need one. Wyndridge Farm – Wow. Wyndridge Farm is everything that it looks to be on their website. In the country at the corner of a winding road. A large facility capable of hosting all sorts of events. A hub-bub of activity where there's plenty of food, beer, and cider to go around. We showed up unannounced, so I didn't get any sort of tour around or poke my nose anywhere uninvited. Would have been difficult anyway since not only was there some sort of homecoming event taking place, but also a full-size-looking wedding. So there was that....and they were able to still keep the bar and restaurant open to the public. Plus, an apparent abundance of staff to ensure that no one goes unserved. Pleasant hour-and-a-half spent at the bar with attentive service. Skipped any food service since we had that waiting in store for us in Columbia. However, menu looked solid and plates of food coming out of kitchen were not skimpy and attractive presentation was paid attention to as well. Got myself into a variety of both ciders and beers. The Oaken Wild (barrel-aged cider was quite nice). I've had quite a few of their standard ciders before in the market and always been at least moderately impressed. Can't say that I recall ever having one of their beers before, so I dove right into that side of the menu. Maybe it was the punishing winds and cold temperatures outside, maybe I was having a bit of palate fatigue, so I mixed it up by first ordering a Nitro Pumpkin Latte. Pause for a second while you process that. Yes, I too, was surprised at ordering something I likely would never consider ordering. Yet, like at Millworks, I was so pleased with the deft balancing of pumpkin, spices, and coffee delivered on a smooth nitrogen pour. Very, very good. Too bad nitro beers don't travel well. Then it was on to Peaches & Plum Sour Ale (6.9% ABV), a nice a soft sour - not overly bracing, which we need more of please. And then the Snow Owl, this roasty and big Imperial Stout (10% ABV). Again, a great balance of roasted malt and spice. I had a taste of the barrel-aged version called Dulce de Brevas, an incredibly decadent and recliner-worthy imperial stout with Columbian sugar, Mission figs, and aged in whiskey barrels. Two bottles to go please. Honestly, with knowing very little about these guys other than their name and rough location, I went in with very little expectation and came up impressed enough to want another visit where I can dive a bit deeper. Big Hill Ciderworks — Proving that bigger never means better, Ben Kishbaugh and Troy Lehman launched Big Hill Ciderworks near Gettysburg a few years ago. I can't tell you where exactly since they're not open to the public and they actually have had incidents in the past of curious cider travelers showing up on their doorstep, only to be turned away. Their neighboring family farms are between 20-25 acres and filled with around 40 varieties of apples. They pick and carefully screen and process the apples prior to making and aging their variety of ciders. They've built the business to where their bottles can now be found at roughly 85 retail accounts in southeastern PA and down to Washington, DC. Here in my neck of the Philadelphia suburbs, they can be found at Teresa's Next Door in Wayne and Rino's Restaurant in Exton. In fact, there'll be a seven-course meal paired with their ciders at TND later in November. What a great opportunity to have perhaps one of the broadest samplings of ciders around. Back at the farm, Ben and Troy are down-to-earth guys with hopes of turning the barn into a tasting room some day so that they can actually entertain those guests that they've had to turn away in the past. 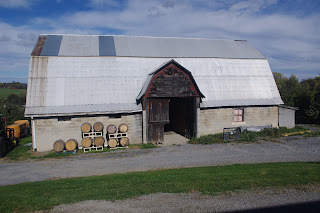 After seeing the property, the barn, and feeling the passion and knowledge for cider making, I'd certainly make the trip to this beautiful rolling landscape part of the state to drink their ciders at the source without hesitation. 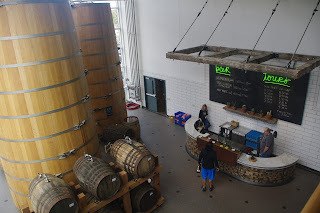 Columbia Kettle Works – This is kind of a fib to say I've never been to CKW before. However, it was my first visit of significant length. Dinner, a few beers, and some live music were part of the visit this time over a couple hours. Last time was a Friday afternoon, if I recall correctly, and this time was a Saturday night in the thick of things. Last time, they'd barely been open to the public, this time they've got more than two years under their belts and an expansion within their building. I really like the vibe at CKW in this riverside town. Though, it's struck me that it seems that in Central PA, every town is aside the Susquehanna River! They've got a great thing going on there and I'm surprised that no one else has given them a run for their money yet with a similar concept. Until then, head to Columbia for the Turkey Hill Experience, the trailhead along the river for a walk/ride/run, and to CKW for well-made sandwiches, accompanying small plates of food like olives, pickles, jerky, cheeses, and popcorn, a diverse lineup of beer styles, and live music on a regular basis. The Back Slap IPA and Sticky Fingers Belgian Tripel were home runs on my palate. If you run into either of the owners Bill Collister or Rod Smith, you'll be treated to a genuinely friendly encounter as well. 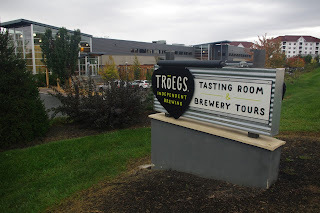 Tröegs – After a tour of the Indian Echo Caverns tucked away off the bank of the mighty Susquehanna River just minutes from the brewery, we spent a few high-quality hours at the brewing pride and joy of Hershey—Tröegs. Seeing their phenomenal growth continues to amaze even the most experienced beer traveler. Even as they grow their markets, the brewing still fits within 24x5 production schedule. New to their headquarters is a space that's been dubbed the Splinter Cellar in what used to house a loading dock and storage area leading to the grain room. Now, that space instead holds three roughly 300-barrel oak foeders. A variety of Splinter Series beers are slated to eventually find their way into the foeders. At the time of my visit, two of three tanks were aging Mad Elf later to be called Wild Elf upon release in a couple years while the other was being swelled with water in preparation for the next beer. The Splinter Cellar also serves as the registration and starting point (complete with three taps) for the guided brewery tours. Self-guided tours are still available. There's plenty of room to mill about in the Cellar along with a mezzanine overlook that includes a gallery showcasing various pieces of winning artwork from the brewery's Art of Tröegs annual contest. Elsewhere around Tröegs, the seasonal menu continues to impress, this time with a Fish Fry Wrap standout that found its way to my table. The draft list continues to be a well-rounded representation of year-round, seasonal, Scratch Series, and Splinter Series beers. The retail shop seems to have an ever-increasing amount of brewery-branded merchandise from glassware to beer to clothing to coasters and playing cards. And the seating (including outdoors) and service round out an always rewarding visit to Hershey. All well-traveled beer hunters should make this a must-stop. Hopefully, the promised expanded parking is next on the improvement list at one of Pennsylvania's finest. Pizza Boy/Al's of Hampden – Choosing from 100 beers on tap is not usually something interests me. But when the lineup is as diverse as it can be at Al's and when they can include upward of 40 or so from the in-house Pizza Boy Brewing and Intangible Ales beers, I'm about as happy as I need to be. Plus, throw in some excellent pizza and there's no doubt that this too is a must-stop for beer lovers when traversing the Harrisburg, Pa. area. Though the service at each of my visits is typically decent, I've always found the ordering process a bit awkward, particularly the part of "no bar service" where every customer including those sitting at the bar must queue up to order everything from food to beer. Minor complaint, perhaps, but when it's crowded and the growler and crowler orders are demanding a lot of server time and attention, it can become frustrating. Nonetheless, if I could ever get past the pizza I might learn more about the rest of the menu. But the "Hot, Hot, Hot", the "Porky", and the "Buffalo Chicken" continue to entrance me, so that might not be happening anytime soon! On the beer side of the menu, after checking out Rubber Soul's Temporada Saison (a new one to me from Salisbury, Md. ), I quickly fell into not one, but two glasses plus a crowler to go of Pizza Boy's Crucial BBQ, described as a lemon, pepper farmhouse ale. The Afternoon Delight "hoppy sour" delighted as well. That's all for this trip folks. Looking to make these excursions more of a regular item. If you like it, let me know.